We’ve already known that a new, faster and cheaper BeagleBone is on the way for a little while, but very few details were provided at the time. 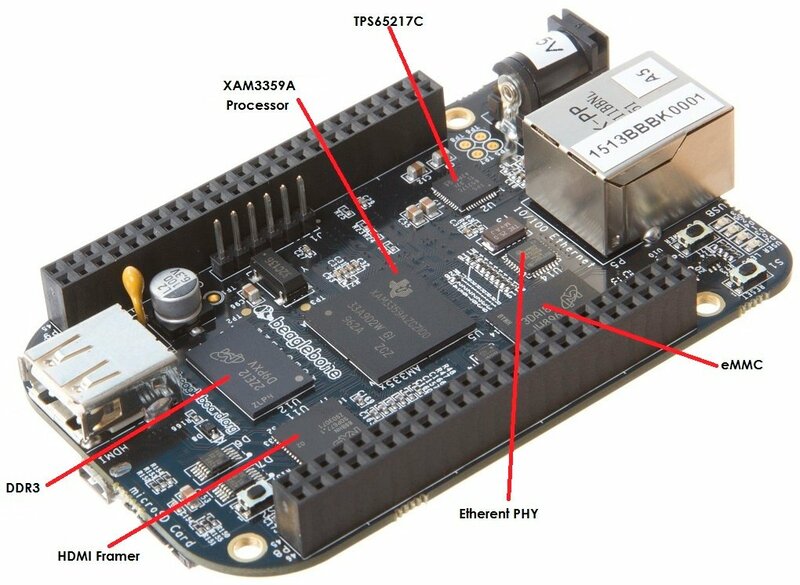 There are now better pictures, the specifications are available, and it looks like the new BeagleBone will be called BeagleBone Black. Video Output – micro HDMI with EDID support, up to 1280×1024 resolution. Expansion Connectors – Power, McASP0, SPI1, I2C, 65x GPIOs, LCD, GPMC, MMC1/2, 7x AIN (1.8V MAX), 4x timers, 3x serial ports, CAN0, EHRPWM0/2, XDMA interrupt, power button, expansion board ID (Up to 4 can be stacked). Power Consumption – 210 to 460mA @ 5V. We’ve also got a table that shows the key differences between the White (Old) BeagleBone and be Black (New) BeagleBone. The onboard HDMI driver uses the LCD pins, and even they are still connected to the expansion header, in some cases, they could cause an LCD cape to have some noise issues. The onboard eMMC uses the MMC1 signals. In order to use these signals on the header, the eMMC device on the BeagleBone Black will need to be disabled. In order to use the NAND or NOR capes, the eMMC on the board will need to be disabled. The 10 pin power expansion header has been removed. If you want to reserve one of the BeagleBone Black, head over to the teaser page, and select one of the resellers. What happened to font size? It’s too small. I hope that new SOC will have dsp for video encoding decoding. it looks unprofessional. It is still more playboard. And I don’t understand output resolution. and no DSP how video/audio decoding/encoding ? Sorry, I found the issue in the middle of the post, and corrected it. AM3359 has been around for a while, but I can’t find AM3559A anywhere. It should be similar anyway. I can’t find a DSP or VPU in this SoC either, so it may not be the board to use if you need HD video playback. The documents for the final version (Rev. A5A) will be slightly different.